iderdider....: just in time for thanksgiving? just in time for thanksgiving? 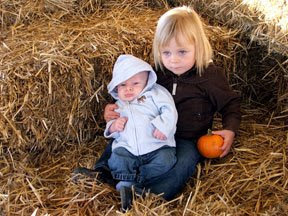 A photo from our trip to the pumpkin patch. We went back to our usual patch. The one went visited last year and the year before that. That I am posting this picture a month after our visit pretty much sums up my life right now. Everett is sleeping a solid 5 or 6 hours a night, but I unfortunately, still require a solid 8 or 9. Claire is managing. Somehow, I am keeping them both alive. There have been many, many trips for coffee. And lots of help from friends. I know that this gets easier, but I still feel like a mother of one masquerading as a mother of 2. I can do one kid. Yesterday, it took somewhere in the neighborhood of an hour and a half to get the three of us ready to go to the library. Storytime lasts 30 minutes, so yeah, that was awesome. Those are 2 lucky kids you got there. Let me know how I can help - anytime. 6 things about month 31.
one little monkey sleeping in the bed. i remember when. i remember when i lost my mind. 2: also about 2 1/2. the princess and the poultry.